Witnesses are being sought to a "serious assault" outside a pub in a Dumfries and Galloway town in the early hours of Sunday morning. 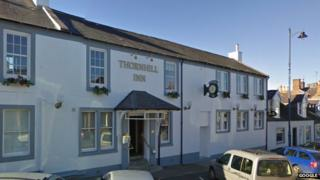 The incident happened shortly before 01:00 near the Thornhill Inn on Drumlanrig Street in Thornhill. Police said a 27-year-old man had been found with serious facial injuries as a result of the attack. He was taken by ambulance to Dumfries and Galloway Royal Infirmary for treatment. Anyone who witnessed the altercation outside the pub has been asked to contact police.